The innovative brains at The Food Network have done it again, turning something ordinary into extraordinary with a melon, a cocktail recipe and our very own faucet and shank kit. Here’s the recipe our friends at The Food Network suggest for the perfect cocktail keg, adapted from The Bubbly Bar, a new cocktail book by Clarkson Potter. Prepare your watermelon by cutting a lid from the top and scooping out the fruit (use 4 cups of the fruit later for your watermelon puree). Drill a small hole near the bottom of the melon, then use a knife to widen the hole until it’s just slightly smaller than the keg shank. Attach the shank and faucet and you’re ready to add your cocktail. After pureeing 4 cups of watermelon chunks, strain. Stir in your fruit-flavored liqueur, gin and sour mix. Chill. Add sparkling rosé before serving. Garnish with lime slice and enjoy! 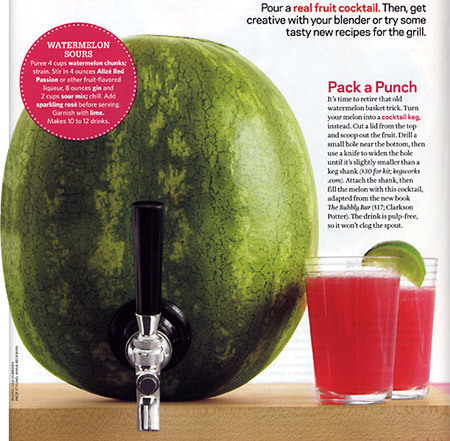 Thanks to the fantastic minds at The Food Network for inventing such a fun and different way to tap into your melon.